Gialova Messinia is a coastal village in important historical site in Navarino Bay, north of Pylos Next beach is Gialova, which is actually two beaches – Golden Beach marching alongside the lagoon and wetland and Gialova itself the beach, which offers a lot of shade along with many bars and taverns. The wetland of Yalova (Divari) is of particular ecological interest as a milestone of many migratory birds. In this rarely found species of birds such as herons and flamingos, ospreys, Black-winged Stilts, avokettes, sandpiper, snipe, curlews, tartaric, terns, and the only kind of chameleon in Europe. 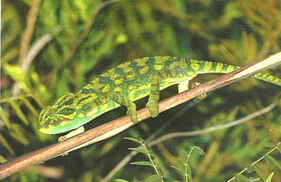 The African chameleon changes color depending on his mood. The wetland of Gialova is a protected area since there are species that belonge to the Greek endangered avifauna. The unique birds enchant with strange silhouettes, with their towering legs, long and weird beaks, their thin and flexible necks. And excite the visitor with the slow dance moves and lure them at their own pace. Between the wetland and the sea behind sydentra junipers and moschomyrista thyme lies another surprise Voidokoilia a perfectly round beach framed by undulating dunes. Continuing on the main road after Fennel will reach a fork. Straight road leads to the castle. At the top of a steep rock-the ancient Koryphasio with stunning views of the surroundings-is the first castle of Pylos and built by the Franks in 1278. You can climb this far (walking) only some of the points in the heart of the castle need attention. If you turn left you will hit the Information Center has created in an old pumping station on the shore of the lagoon Gialova the Greek Ornithological Society. Open every summer from mid-June to mid-September (19.00-22.00) by distributing information material and organize tours in wetlands. Besides the exhibition, is the starting point for a visit to the “Nature Trail” and ecological tours for bird watching (birdwatching) with equipment (binoculars, telescope, etc.) available to the HOS. To visit schools and other organized groups of visitors in the area, please contact the Program Coordinator Pylos Mr. George Maneas (tel. 6979809570, gialova@ornithologiki.gr). Specifically, the lagoon is a natural wetland which, although in recent years has undergone a relative decline, it joined the program Life Natura 2000, to protect the area. It is a brackish habitat total area of ​​2,000 hectares, which receives the inflow of sea water and fresh water from rivers and Tyflomyti Xerolagkado, which find safe shelter many species of migratory birds during their passage to the south. Some of the breeding species observed by the Observatory of the PBC is the Bittern, the Short-toed Eagle, the Stilt, the Little Tern, the Alkyoni and Pratincole. 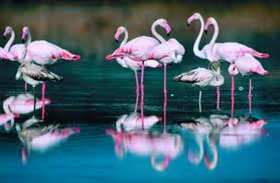 Also have been found on passers birds such as Cormorants, Glossy, purple heron, flamingos, swans, prey like vultures, buzzard, osprey, Peregrines, gulls, wading birds such as Avocets, Spoonbills, Curlews, Golden Plovers, Potamotringes, such as Nocturnal Owl, Barn Owl, Nanompoufoi , and various songbirds such as blackbirds, blue rock thrush, goldfinch, oriole, grouse, monks and galazopapaditses, flycatchers and tsirovakoi, warlblers and pampola sparrows and magpies. The turquoise waters of the lagoon there is absolute calm, mirrored and reflected the surrounding areas. In these clear waters bred various fish species. Walking on the edge of the lagoon we saw in the water and crabs, and various reptiles such as chameleons, lizards, turtles and snakes took refuge inside the scattered shrublands and often surprise us by dragging them into the tranquility that prevailed. This beautiful ecosystem attracts many visitors, schoolchildren and volunteers approaching room not only for the knowledge and awareness of respect and love for the natural environment, but also to enjoy moments of calm and relaxation and a representations of colors and sounds are unique aesthetics. 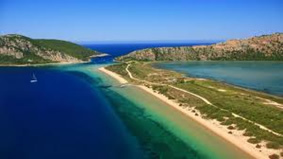 If traveling by boat then you will find safe haven in the marina of Pylos (tel. : 27230 22225).